Can the measurement of brachial artery flow-mediated dilation be applied to the acute exercise model? The measurement of flow-mediated dilation using high-resolution ultrasound has been utilized extensively in interventional trials evaluating the salutary effect of drugs and lifestyle modifications (i.e. diet or exercise training) on endothelial function; however, until recently researchers have not used flow-mediated dilation to examine the role of a single bout of exercise on vascular function. Utilizing the acute exercise model can be advantageous as it allows for an efficient manipulation of exercise variables (i.e. mode, intensity, duration, etc.) and permits greater experimental control of confounding variables. Given that the application of flow-mediated dilation in the acute exercise paradigm is expanding, the purpose of this review is to discuss methodological and physiological factors pertinent to flow-mediated dilation in the context of acute exercise. Although the scientific rationale for evaluating endothelial function in response to acute exercise is sound, few concerns warrant attention when interpreting flow-mediated dilation data following acute exercise. The following questions will be addressed in the present review: Does the measurement of flow-mediated dilation influence subsequent serial measures of flow-mediated dilation? Do we need to account for diurnal variation? Is there an optimal time to measure post-exercise flow-mediated dilation? Is the post-exercise flow-mediated dilation reproducible? How is flow-mediated dilation interpreted considering the hemodynamic and sympathetic changes associated with acute exercise? Can the measurement of endothelial-independent dilation affect the exercise? Evidence exists to support the methodological appropriateness for employing flow-mediated dilation in the acute exercise model; however, further research is warranted to clarify its interpretation following acute exercise. A marked increase in blood flow exerts a frictional force or shear stress on the endothelial surface causing the vessel to dilate . On the basis of this physiological phenomenon, in 1992 Celermajer et al. developed a non-invasive reactive hyperemia technique to assess endothelial function in the conduit artery. This technique utilizes a transient (5-min) suprasystolic forearm occlusion to generate a hyperemic-induced shear stress stimulus and subsequent vasodilation, which can be detected at the brachial artery via high-resolution ultrasound. The percent change from baseline diameter to post-occlusion diameter is calculated (flow-mediated dilation, FMD) and used as an index of endothelial function [2, 3]. In 1995, Joannides and colleagues  were the first to examine the nitric oxide (NO) contribution to the FMD response in humans and found that NO blockade completely abolished FMD. At the moment, it is well accepted that FMD, when performed following the published guidelines , provides a functional bioassay for in vivo endothelium-derived NO bioavailability . FMD is demonstrated to be reproducible [6–9], correlates with invasive measurements of endothelial function in the coronary arteries [10, 11], and predicts future cardiovascular events [12, 13]; other studies, however, have demonstrated that reduced FMD is a poor marker of the presence and severity of angiographically assessed coronary artery disease  and fails to show a prognostic value . Albeit this conflicting evidence, FMD is still the preferred non-invasive outcome variable in intervention studies aimed at reducing atherosclerotic cardiovascular disease. Although brachial artery FMD has been extensively utilized in intervention trials evaluating the salutary effect of drugs and lifestyle modifications (i.e. diet or exercise training) on vascular function , until recently researchers have not used FMD to examine the role of a single bout of exercise on NO-mediated endothelial function [16–24]. As advocated by Thompson et al. , it is possible that the effects of a bout of exercise (acute exercise) can predict the effects of chronic exercise (accumulation of single bouts of exercise over time), as is the case in several variables; blood pressure reduction being a prime example . Utilizing the acute exercise model can be advantageous as it allows for an efficient manipulation of exercise variables (i.e. mode, intensity, duration, etc.) and permits greater experimental control of confounding variables. The acute exercise model can also be useful in investigating mechanisms of the exercise (acute or chronic) response. Given that the utilization of FMD in the acute exercise model is justified and emerging, we consider the discussion of methodological and physiological factors pertinent to FMD in the context of acute exercise timely. The purpose of the present review is to summarize the current literature on FMD in acute exercise and to discuss both the foundations and considerations applicable to the acute exercise model and FMD. Although the number of investigations reporting brachial artery FMD following exercise is scarce [16–24], the purpose for the study of post-exercise endothelial function and the diversity of the populations studied are not [see Additional file 1]. Oxidative stress , systemic and regional hemodynamics , postprandial endothelial function , endothelial response to acute exercise [16, 23], inhaled particulate matter , and muscle ischemia  have been the focus of studies utilizing FMD in the acute exercise paradigm. Subjects have ranged from intercollegiate athletes  to apparently healthy adults  including pre- and post-menopausal women  and habitually sedentary men ; and to patients with claudication [17, 21, 22], renal disease , and who are overweight . The breadth of journals publishing research articles utilizing the acute exercise model include cardiology [16, 21, 22], hypertension , exercise , thrombosis , obesity , physiology , and toxicology  foci. The only consistency found across all these studies is the use of treadmill walking/running as the mode of exercise. We consider treadmill exercise as a suitable mode due to its systemic effects and representation of the most common form of physical activity. Figure 1 illustrates a representative experimental set up and design for evaluation of the FMD response to acute exercise. Representative experimental set up and design for evaluation of the FMD response to acute exercise. The acute exercise model has been utilized beyond the basic research studies listed in additional file 1. Investigators in the Framingham Study measured the post-exercise FMD in some of their epidemiological research on coronary heart disease . Acute handgrip exercise has also been utilized during the occlusion phase to enhance ischemia and the subsequent hyperemic stimulus for FMD [27, 28], or in substitution of occlusion . The shear stress associated with one bout of exercise has also been observed by Tanaka et al. and our group (data in review) in attempts to investigate the mechanism of exercise training-induced improvement of endothelial function. In addition, Gaenzer and colleagues  compared brachial artery vasodilation during cycle ergometry in smokers vs. nonsmokers. Thus, the use of the acute exercise model is even more diverse than the pre-to-post observation. Questions arise from acute exercise studies in terms of the interaction of FMD and exercise. In most cases, only one post-exercise FMD measurement was performed [16–24], but on occasions FMD has been measured hourly following a treatment [32–34]. Do serial measurements of FMD influence subsequent measures of FMD? Do we need to account for diurnal variation? Is the post-exercise FMD reproducible? Commonly, both measurements, FMD (endothelial-dependent dilation) and nitroglycerine-induced endothelial-independent dilation, are performed (within 10 min)  before and after a long-term treatment in order to determine whether changes in FMD are truly reflective of changes in endothelial function. When measurements of the endothelial dependent/independent dilation are applied to the acute exercise model, the following question arises: What is the influence of the nitroglycerine on the subsequent bout of exercise? If the exercise is delayed to account for washout of nitroglycerine, can the subsequent FMDs be compared to the baseline? Only three investigators [18, 20, 22] measured endothelial independent dilation with the use of nitroglycerine; one on a separate day , and the other two following both the pre- and post-exercise FMD measurements [18, 20]. Neither investigator who administered nitroglycerine before exercise [18, 20] reported the time between the endothelial-independent dilation measurement and exercise or addressed this issue. How can the separation of one day between the measurements of dependent and independent pathways be interpreted? Exercise evokes hemodynamic and sympathetic changes which, in turn, may influence FMD. How is FMD interpreted considering these physiological changes associated with acute exercise? The timing of the measurement of the post-exercise FMD ranged from immediately post  to 23 hours post-exercise . Is there an optimal time to measure post-exercise FMD? A diversity of interest in the acute exercise paradigm is evident from the current literature. For this reason, we consider the discussion of the foundations and considerations of applying FMD to the acute exercise model timely. The foundations to apply FMD to the acute exercise model have been established. First, similar to diet [34, 35] and pharmacological research [36, 37], the study of acute effects of exercise requires serial measurements to be taken in the same day but at succeeding times. Evidence suggests that serial FMD measurements do not affect subsequent FMD outcomes . Second, diurnal variation has not posed a methodological problem in studies of less than two hours between FMD measurements . Third, reproducibility has been well documented for FMD measurements [6–9] and recently for the acute exercise model . To investigate the influence of serial measures of FMD, brachial artery FMD was measured every 30 min (T30), every 60 min (T60), and every 120 min (T120) on three separate, randomized treatment days for a two hour period, beginning at 8:00 am; totaling 5, 3, and 2 measurements respectively. Subjects were 16 healthy young adults (9 men, 7 women), age 22.5 ± 0.8 yrs. The first (8:00 am) and last (10:00 am) FMD of each treatment time period were analyzed with ANOVA and intra-class correlations (ICC). No significant differences (p > 0.05) in FMD were found between the first (F) and last (L) measurements, within (p = 0.838) and between (p = 0.819) treatments. The ICC for all treatments combined was 0.7113. The ICCF-L for T30, T60, and T120 were 0.6068, 0.7415, and 0.7956 respectively. Thus, it appears that repetitive reactive hyperemia does not affect the FMD outcome . In order to ensure that the FMD measurements are not influenced by diurnal variation, two different approaches from a study-design standpoint can be undertaken. First, the use of a non-intervention control day may be employed. This approach has been extensively used to investigate the acute effects of interventions on other physiological variables (e.g. blood pressure) that also exhibit diurnal variations [39–41]. For FMD, the use of a control day may not be suitable due to the day-to-day FMD variability . Second, it is the evaluation of the FMD response to exercise during a time of day that shows evidence of non-variable FMD. The examination of FMD was performed in 20 healthy young adults (age = 23.1 ± 0.73 yrs) every 30 minutes from 8 am to 10 am . Subjects exhibited a stable FMD response throughout the two hour morning period (p = 0.348). These results suggested that there is minimal variation during the two-hour morning period. A prolonged period of time, however, needs to be examined to further describe the diurnal rhythm of FMD. The reproducibility of FMD following exercise was measured in nine middle-aged (56.4 ± 7.0 yrs), sedentary overweight men who performed two bouts of treadmill walking at 50% of VO2peak for 45 min (separate days) . FMD was measured pre- and post-exercise (hourly for three hours). The two trials were within the acceptable 2–3% variation reported in the guidelines for brachial artery FMD measurement . In addition, the intra-class correlation coefficient (ICC) for the difference in post-exercise FMD from baseline between the two trials was 0.595 (p = 0.028). Thus, the reproducibility for FMD following moderate intensity exercise is within the recommendations for resting brachial artery FMD measurements. Thus, evidence in serial measurements, diurnal variation, and reproducibility support the methodological appropriateness for employing FMD in the acute exercise model. Beyond these methodological concerns; however, other physiological considerations now emerge. Physical exercise is a physiological stimulus evoking a variety of transient biological alterations (i.e. blood flow, vascular tone, sympathetic activity, etc.) that should be, at the minimum, considered when interpreting the FMD response to exercise. Factors that are related to the FMD as the outcome measure as well as aspects referring to the mechanism of the FMD response will be discussed. Unfortunately, an analogous situation occurs when pre- to post-acute exercise FMD comparisons are being performed. In this context, a post-exercise dilated artery may be associated with a relatively low FMD; hence, complicating appropriate interpretation of the results. This concern may be amplified when FMD measurements are performed immediately following cessation of exercise where vasodilation may be maximal. Unpublished data in our laboratory shows that brachial artery FMD is decreased immediately post-treadmill exercise (45 min) in an intensity dependent manner. Although it is possible that this response is mediated, at least partially, by exercise-induced oxidative stress , it is likely that the vasodilation associated with exercise contributes to the attenuation in FMD. Figure 2 illustrates brachial artery vasodilation immediately post-exercise (right shift of data points) and the associated reduction in FMD (down shift of data points). The influence of exercise on baseline diameters and subsequent FMD. Exercise (45 min @ 75% VO2max) was performed by 12 middle aged overweight men on a treadmill. 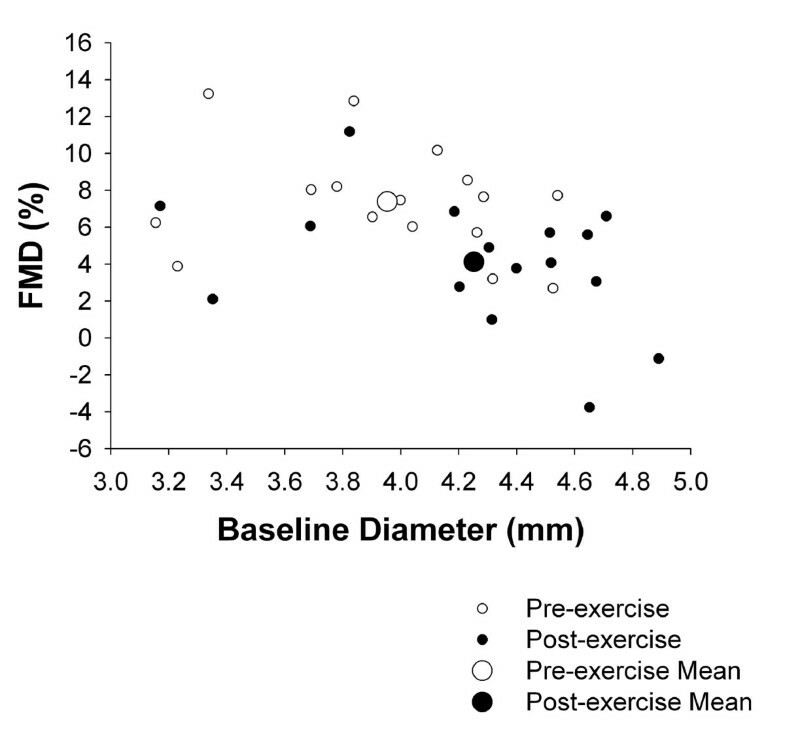 FMD measurements were obtained before and immediately (<10 min) post-exercise. Second, the influence of exercise-induced shear stress deserves attention. Recently, our group found brachial artery shear stress to remain elevated for two hours following walking exercise (data in review). Superimposing the exercise- and reactive hyperemia-induced shear stress may modify the overall stimulus for FMD. Although Pyke and colleagues [45–47] have developed attractive methods to control for the variability in reactive hyperemic shear stress, the impact of an altered pre-hyperemic shear on the FMD measurement has not been clarified. Original statistical solutions are now being proposed  but further endeavor is warranted. Last, the impact of exercise-induced sympathetic activity modulation on FMD should be addressed as it may alter the mechanism of the FMD response. The sympathetic nervous system is critical in maintaining cardiovascular homeostasis in humans . Researchers have used a number of acute stimulations (i.e. cold pressor test, mental stress, low body suction) to investigate the impact of elevated sympathetic activity on the vasculature and they have observed a transient reduction in FMD following the stress [50, 51]; although findings appear to be dependent on the nature of the stimulus . In a recent study, Thijssen et al. utilized leg exercise to locally reduce sympathetic responsiveness (functional sympatholysis) and found that older men were able to restore their blunted FMD in the femoral artery. Given that sympathetic nerve activity is decreased for several hours following a bout of exercise [53, 54], it is possible that improvements observed in FMD following acute exercise can be partially explained by attenuation in sympathetic outflow, and may not necessarily reflect enhanced NO bioavailability. Interestingly, Harvey et al. reported a significant increase in brachial artery FMD following acute exercise in post-menopausal women, whereas no change was observed in young pre-menopausal women. Providing that sympathetic nerve activity increases with advancing age , it is not unreasonable to speculate that improvement of FMD found in the older women  could be attributed to reduction in sympathetic outflow following exercise. In other words, in physiological states where alteration of sympathetic activity likely exists (i.e. post-exercise), caution should be taken when making the link between FMD and NO bioavailability. In this post-exercise context, it is possible that FMD represents a combined reflection of NO bioavailability and sympathetic modulation. Collectively, the unequal pre- to post-acute exercise hemodynamic and sympathetic states may complicate FMD comparisons and interpretations associated with exercise. It is also possible that the exercise-associated changes in FMD may not well reflect actual NO-mediated endothelial function changes. Furthermore, concerns regarding proper interpretation of acute exercise and FMD data and accurate comparison of findings among studies may simply result from substantial discrepancies in FMD protocols utilized across labs. In an effort to standardize the FMD measurement among researchers, guidelines for the use of FMD were published in 2002 ; however, it appears that further work is needed to ensure consistency in methodology. In 2005, Pyke and Tschakovsky  provided thorough reasoning on the serious consequences of varying the FMD protocol on interpretation of the data. They reviewed the implications of several FMD technique modifications, including placement of cuff occlusion, duration of cuff occlusion, addition of ischemic handgrip exercise, and location of ultrasound prove (brachial versus radial artery). In addition, inconsistency exits in the literature regarding the timing of post-occlusion diameter measurements. The fix measurement at the 60-second mark has been traditionally used [32, 34]; however, some data suggest that the time-to-peak response may be longer in disease populations . This problem is currently solved with the utilization of wall-tracking software capable of monitoring the entire time course response. Further research is warranted to validate the use of FMD with acute exercise. In particular, future investigations should 1) examine the FMD diurnal rhythm and determine longer time periods of stable FMD; 2) identify the optimal time to measure post-exercise FMD; 3) compare the effect of different modalities of acute exercise on FMD to determine whether exercise produces a localized or systemic effect; 4) determine whether the measurement of endothelial-independent dilation (use of nitroglycerine) affects the exercise bout; 5) resolve the influence of exercise-induced vasodilation (change in baseline diameters) and/or augmented shear stress on the FMD outcome; and 6) determine the impact of exercise-induced sympathetic activity modulation on the mechanism of the FMD response. The later questions could be approached by incorporating endothelial NO synthase inhibitors (i.e. L-NMMA) into the FMD measurements before and after exercise. Is the abolishment of FMD induced by L-NMMA at post-exercise the same as that found pre-exercise? Inhibition of endothelial NO synthase would provide with evidence of the presence or absence of non-NO factors potentially influencing the FMD response to exercise. In addition, studies are needed to determine whether changes in FMD induced by acute exercise are accompanied with changes in other accepted markers of endothelial function such as circulating adhesion molecules (ICAM-1, VCAM-1, E-selectin) and Von Willebrand factor . Surprisingly, only one out of all published studies  evaluating the effect of acute exercise on FMD has reported other markers of endothelial function. In this study, Silvestro et al. found soluble VCAM-1 to mildly accompany changes in FMD induced by acute exercise in combination with a pharmacological treatment; whereas soluble ICAM-1 did not follow the FMD pattern. Correlation analysis between delta change in FMD and soluble VCAM-1 was not performed. Although it can only be speculated, we are concerned that, if in fact more studies examining multiple endothelial markers do exist, the lack of association between FMD and these markers may be the cause of this gap of information in the literature. Unfortunately, it is indisputable that studies failing to find an association or lacking statistical significance are of less interest. In conclusion, the scientific rationale for evaluating endothelial function in response to acute exercise is sound. Evidence exists supporting the methodological appropriateness for employing FMD as an outcome measure in the acute exercise model. Few concerns, however, warrant attention when interpreting FMD data following acute exercise. JP is sponsored by a Fellowship from the Ministerio de Educación y Cultura de España. JP and JPW significantly contributed to manuscript writing and RAH significantly revised the manuscript for important intellectual content. All authors read and approved the final manuscript.